This could be presented as a pencil and paper exercise in a textbook, but the materials tempt students into the problem through the familiar context of actually 'making' the pizzas. As a result the challenge becomes both more accessible and more enjoyable. The clever counting that is required to find all the combinations of ingredients is non-trivial and extensive. The task has several levels of extension and yet allows students to leave it at several levels and still experience success. The first question students are likely to ask is Can we have more than one serve of each topping on a pizza?. The card is deliberately left open so this is likely to happen because often a mathematician has to define the limits of their problem before they can begin. In this case there are going to be significantly fewer solutions if you are not allowed to repeat a topping, so using that rule might be a good place to start. And that answers both questions in the challenge. There are 16 pizzas and we know we have found them all because we have broken the problem into smaller parts and considered every possible case. What happens if we are limited to a different number of toppings? More toppings would give more pizzas, so perhaps it is sensible to consider fewer toppings first. We might notice a few things that help us predict the table for up to 5 toppings and beyond, without needing to make the pizzas. The total is a sequence of powers of 2. There will always be only one way to make the 0 toppings and all toppings pizzas. The number of 1 topping pizzas will always be the same as the number of toppings available. The number of pizzas for one less than the all toppings pizza will always be the same as for the one topping pizza, because it could be made by subtraction from the all toppings pizza instead of addition to the base. That is, beginning with the all toppings, the only way to make the pizzas with one less is to take off a single topping and that can only be done in the same number ways as there are toppings. So using these observations helps us complete some of the table for up to 5 toppings - Y, G, W, R, B (for black olives perhaps). There are 5 flavours Y, G, W, R, B. Choose 1 to be on the pizza, say Y, then there are only 4 toppings that can be paired with it. There are no other ways to use Y, so no more pizzas can include it. Choose the next one to be on the pizza, G, then there are only 3 toppings that can be paired with it, because G has already been paired with Y. There are no other ways to use G, so no more pizzas can include it. Choose the next one to be on the pizza, W, then there are only 2 toppings that can be paired with it, because W has already been paired with G and Y. There are no other ways to use W, so no more pizzas can include it. Choose the next one to be on the pizza, R, then there is only 1 topping that can be paired with it, because R has already been paired with W and G and Y. There are no other ways to use R, so no more pizzas can include it. Choose the next one to be on the pizza, B, then there are no other toppings that is hasn't been paired with already, so there are no more pizzas to make with it. So the total number of 2 toppings pizzas from 5 ingredients is 4 + 3 + 2 + 1 = 10. A similar argument about subtracting from the five 4 toppings pizzas must also produce 10 pizzas. Try it. which is known as Pascal's Triangle (see Task 144, Pascal's Triangle in Asia), more patterns emerge. For example each number within the triangle is the sum of the two above it and this allows us to easily calculate the pizzas for up to 6 toppings. And, not surprisingly, these numbers sum to a power of 2, so there are 64 pizzas that can be made with up to 6 toppings. What happens if we make pairs from the maximum toppings used number and the total pizzas number ... (0, 1) (1, 2) (2, 4) etc... and explore their graph? The outside diagonals in either direction are 1. Why? The next diagonals are the natural numbers. Why? The next diagonal is the triangle numbers. Why and how do they relate to the natural numbers? What other patterns can be found in the triangle? But perhaps enough is enough. But we could return to the original assumption that toppings can't be repeated and ask what happens if you are allowed to use multiple serves of the same topping. How many pizzas can be made then? It is easy to set the context for this lesson by discussing how pizzas are made and the students' experiences with pizza shops. Highlight that in the shop the chef first gets a base and then slides it along a set of tubs that each have a toppings. You can choose to have or not have the various toppings. Pairs of students then set up their pizza shop with counters, tiles or blocks in colour piles across the top of their table. The bases are easy to make by folding, creasing and tearing paper. An A4 piece of paper can quickly supply 8 bases, 16 if each student in the pair folds, creases and tears one piece. Alternatively you might like to print this page of 6 pizza bases. Explain that you aren't really trying to recreate a full pizza shop, but rather the same idea in the home kitchen so the kids can make pizzas for the tea. 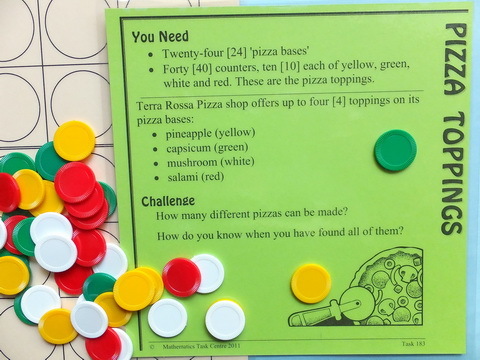 That allows the number of toppings to be limited and your class will easily accept that before they started you asked your children to guess how many different pizzas they would be able to make. That's what maths teachers do! Encourage your class to make the same guess. Now they want to find out which guess is correct and so the investigation begins. The iceberg notes above allow you to guide the investigation to whatever level of success is appropriate for the class and individuals. For more ideas and discussion about this investigation, open a new browser tab (or page) and visit Maths300 Lesson 74, Pizza Toppings, which also includes an investigation guide with answers and discussion. The guide highlights some of the extensions above and adds suggestions for senior classes which link the task to coefficients in the expansion of (1 + x)t, where t is the number of toppings available, and developing and proving formulas, such as the link between the natural and triangle numbers, perhaps by Mathematical Induction.